The Graston Technique (GT) is an Instrument-Assisted Soft Tissue Mobilization (IASTM) Technique that is used by a variety of healthcare providers for an even wider variety of conditions. GT is performed on people of all ages and athletic abilities, from NFL players to office desk-worker retirees. Graston was created over 20 years ago by a patient who was frustrated with his lack of progress in physical therapy post-surgery. The patient consulted healthcare professionals and crafted different metal instruments to treat his injury. The Graston Technique, now used by clinicians around the world, utilizes six different metal instruments to evaluate and treatment various areas of the human body. The Graston Technique is common in many settings. Although the Graston Technique can be used in virtually every area of the body, podiatrists, in particular, seem to applaud the use of Graston. For the ankles & feet, Graston is helpful for a variety of conditions, most notably for plantar fasciitis and calf muscle tightness. In my experience, those suffering with chronic headaches and migraines often experience a decrease in symptoms with the Graston Technique. These patients usually display tightness in the upper traps, posterior shoulder, and suboccipital regions. Many people enjoy the treatment, and want it done regularly. There are some who will not enjoy the Graston Technique, but the vast majority do. The Graston Technique can be used for a variety of different cases to treat the restrictions and adhesions in the soft tissue from injuries, post-op surgeries, chronic misuse, bad posturing, and more. Overall, the Graston Technique is one extra tool you can add to your manual therapy toolbox. The Graston Technique utilizes cross-friction massage via six different metal tools - which vary in purpose and size - to rub against the grain of scar tissue and muscle “knots.” At the beginning of the Graston Technique, the therapist will often “scan” the area with a larger tool. Affected areas will feel “bumpy” and/or turn red. Patients will often be able to feel “trouble spots” while you are scanning the area. After the therapist has identified the areas he or she wants to work on, the therapist will often use a smaller, more precise tool to focus on specific areas. The first session is typically lower in intensity. At subsequent sessions, the therapist may increase the pressure and overall intensity of the treatment. On average, the Graston Technique will be performed for 3-8 minutes in a single area. There should usually be a 48-hour gap between Graston sessions, or more pending patient presentation. The Graston Technique often needs to be performed multiple times to achieve optimal results. The Graston Technique is also useful for reducing fascia restrictions in a certain area. Imagine the affected area is a bunch of spaghetti noodles scattered all over the place. The Graston Technique helps place those noodles back in the box, often more optimally than stretching, foam rolling, and other soft tissue mobilization techniques alone. Side effects of the Graston Technique, especially after the first session, include redness and/or minor bruising. Therefore, patient education is key! The Graston Technique can be fully learned in two classes. Those who complete Graston M2 training can go on to earn their Graston Technique therapy specialist (GTS) credential. The classes are very hands-on, and quite honestly, a lot of fun. You will spend most of the two days of classes performing the Graston Technique on others, and having them perform the technique on you. Both classes are generally comprised of clinicians of all age ranges and experience levels. In my class, I met clinicians younger than me, and clinicians that have been in the business for 20-30+ years. The Graston Technique is useful for many diagnoses and situations. The Graston technique helps patients do something they cannot do at home. As great and important as stretching and therapeutic exercises are, some patients (particularly those in their mid-20s to mid-30s for me) will come for 1-3 session(s), learn all the exercises and stretches they can, and then self-discharge, claiming they will do everything we have done at home or at the gym. Continual use of the Graston Technique can lead to a decrease in overall treatment time and duration. As stated before, GT can help decrease tightness and pain more optimally than stretching, exercises, foam rolling, and other soft tissue mobilization techniques alone. During physical therapy sessions, you might be able to complete “more” in the shorter period of time. Furthermore, you might be able to help your patients achieve “more” with less visits. You can become well-known in your area. A word-of-mouth referral is one of the best compliments a physical therapist can receive. Often, a patient satisfied with the Graston Technique will tell their friends, family, doctor, etc. of the success they have had. Depending where you live, you can become known as the “Graston Therapist” for your area. It is less fatiguing for you, the clinician. I am in my mid-20s, but I can still feel the fatigue in my hands after a long day of different manual therapy techniques. Many older therapists I met at the Graston course can seldom perform basic soft-tissue mobilization with their hands, due to decades of fatigue and muscle wear. However, the Graston Technique is more ergonomically efficient, and therefore less tiring on your hands. The M1 class even shows you how to properly perform cervical distraction, scapular mobilizations, and scar mobilizations with the tools, which are less taxing on your body than the traditional methods (and still very comfortable for the patient). As any experienced PT will tell you, do what you can to help your helping hands! If you have liked what you have read so far, stay tuned! 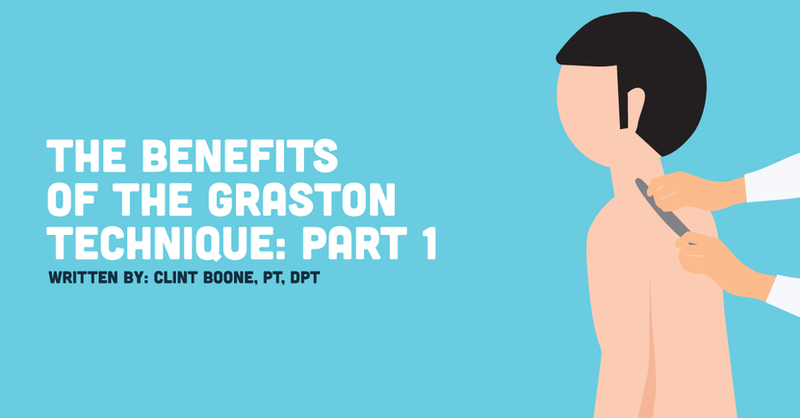 There will be a second post coming soon about ways you can incorporate Graston in your practice, and evidence-based research that demonstrates the effectiveness of Graston. And if you have had Graston performed on you, or have taken the Graston classes yourself, let us know in the comments! Disclaimer: I am in no way associated with, nor do I hold any financial interest in, Graston Technique, LLC. I simply took the M1 course, incorporated it into my practice, and have seen Graston help many of my patients.